A Thévenin or Norton equivalent circuit is valuable for analyzing the source and load parts of a circuit. Thévenin’s and Norton’s theorem allow you to replace a complicated array of independent sources and resistors, turning the source circuit into a single independent source connected with a single resistor. Using the Thévenin or Norton equivalent of a circuit allows you to avoid having to reanalyze the entire circuit over and over again, just to try out different loads. To simplify your analysis when interfacing between source and load circuits, the Thévenin method replaces a complex source circuit with a single voltage source in series with a single resistor. To obtain the Thévenin equivalent, you need to calculate the open-circuit voltage voc and the short-circuit current isc. Circuit A shown here is a source circuit with an independent voltage source connected to a load circuit. Circuit B shows the same circuit, except that the load circuit has been replaced with an open-circuit load. You use the open-circuit load to get the Thévenin voltage, vT, across Terminals A and B. The Thévenin voltage equals the open-circuit voltage, voc. Solving for voc gives you the Thévenin voltage, vT. Circuit C shows the same source circuit as a short-circuit load. You use the short-circuit load to get the Norton current, iN, through Terminals A and B. And you find the Norton current by finding the short-circuit current, isc. This short-circuit current, isc, gives you the Norton current, iN. Circuit D shows the Thévenin equivalent for the source circuit in Circuit A. 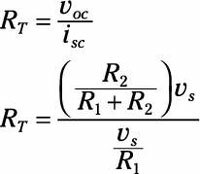 The preceding equation looks like the total resistance for the parallel connection between resistors R1 and R2 when you short (or remove) the voltage source and look back from Terminals A and B. 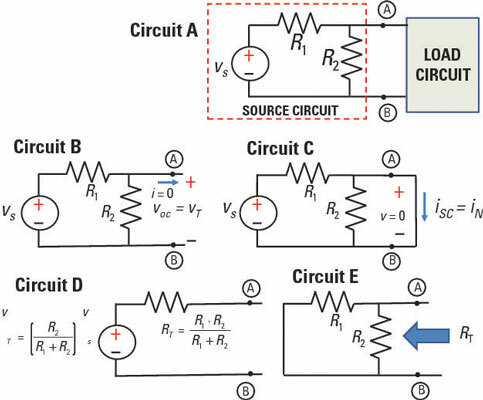 To see how to use the Norton approach for circuits with multiple sources, consider Circuit A in the sample circuit shown here. Because it doesn’t matter whether you find the short-circuit current or the open-circuit voltage first, you can begin by determining the open-circuit voltage. Putting an open load at Terminals A and B results in Circuit B. The following analysis shows you how to obtain is1 and RN in Circuit B. The current supplied by the voltage source vs goes through resistors R1 and R2 because the current going through an open circuit load is zero. In Circuit B, you can view the current source is as a device having an infinite resistance (that is, as an open circuit). The minus sign appears in these equations because the current from is flows opposite in direction to the assigned voltage polarities across the resistors. The open-circuit voltage is equal to the Thévenin equivalent voltage, voc = vT.
Next, find the short-circuit current in Circuit C of sample circuit shown here. The Norton current iN is equal to the short-circuit current: iN = isc. When you look left from the right of Terminals A and B, the Norton resistance is equal to the total resistance while removing all the independent sources. You see the Norton equivalent in Circuit D of the sample circuit, where RT = RN.